→GreenWorks Pressure Washer : Too Strong for Car Washing? GreenWorks Pressure Washer : Too Strong for Car Washing? Need a fast and easy way to clean the outside of your house, brick pavers, sidewalks or front porch? 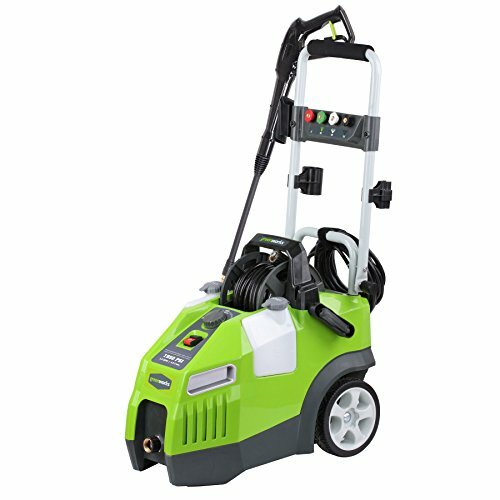 If so, investing in this GreenWorks pressure washer gpw1950 might be a good way for you to spend your money. Not only will it save you in having to rent equipment in the future, it will make your home and exterior surfaces look sparkling clean. One of the best we’ve found is the GreenWorks GPW1950, which offers a powerful motor with 1950 psi of pressure. This is more than enough to clean any exterior surface like your sidewalk, brick patio, concrete driveway or even your car (just make sure to test out the spray first so it’s not set too strong). One of the great things about this pressure washer is that it’s compatible with any part that can work at 1950 psi and has a ¼” quick connection. This means if you have a foam blaster, tire brush, 5-1 nozzle or rotating brush from a different model or old unit, they may still work. This Green Works model is very easy to use, and one of the best features is that you don’t have to turn it off if you need to step away for a few moments. Much like a good garden hose nozzle, the spray nozzle on this model only puts out water when the trigger is depressed. That means you can rinse your car, and then leave the unit running while you soap it up. Also, the compressor doesn’t run if you’re not pressing the trigger, so if you let it sit, it’s nice and quiet. As for maneuverability, it also gets a high score. Reviews say it’s easy to lift and move around and also easy to operate with one hand. For power, user reviews agree it has plenty. It has a powerful 13 amp motor that is water resistant, and it can put out up to 1.2 gallons per minute. At 1950 psi, it puts out a much better outflow than other units putting out around only 1500 psi. After assembling the wand and connecting the pressure hose, connect it to your water supply using any garden hose. You need 50 psi from the incoming water line, which is pretty standard for most homes. Water enters the washer and is then pressurized using an electric motor and exits the spray nozzle. What about the soap tanks? This model is a step above many in that it has dual own soap dispensers that work with all of the nozzles included. The soap releases at low pressure and is best used with the included soap nozzle. If you’re using a concentrated soap like Simple Green, you’ll want to dilute according to the package directions prior to filling up the soap tank. If you’re using soap that doesn’t require any dilution, you can pour it right in and go to work. Can I wash my car with it without taking off the paint? If you’re looking to clean your car, this model will work great. Just make sure you test out the nozzle first to make sure the spray is adjusted to exactly where you need it to be. The best way to wash your car in this way is to first rinse your truck or car thoroughly. Even if you just took it through the car wash, there will still be some dirt and dust you want to get off before soaping it up. Make sure you get underneath and around the tires as well. Lots of dirt tends to stick up in the wheel wells. Use a mild detergent that is safe for car paint. Dawn dish soap and Simple Green are just two of many you could choose. Spray on the detergent in overlapping strokes so you make sure you don’t miss any spots. Work from the bottom up. Then, let the soap sit for 5-10 minutes, giving it time to work on the grime. If you need to, use a brush to scrub off any built up dirt or any you find in crevices or corners. A rotating brush works great for this but isn’t required. After the soap step is done, rinse off the car using high pressure. Starting at the top is best so any remaining soap residue runs down onto the ground. Make sure to keep the spray nozzle a distance away from the car’s paint, as getting too close with high pressure could cause unwanted damage. Holding it a couple of feet away works best. If you need more concentrated cleaning, gradually move it closer until you get the desired result. Do I have to add oil? There’s oil in the pump when you get it, so you don’t have to add any. The nozzles you get with this unit aren’t just cheap plastic like with some other pressure washers. Instead, they are plastic covered metal (specifically brass), so the part that counts is solid. Additionally, the plastic coating is color coded so you can keep track of which one you’re using. Many products nowadays seem to be throwaways, so the question of longevity is a very good one. We love products that are built to last, and this one is. One user review from a man who has owned his for over five years says it’s still going strong. This model is also certified by the Pressure Washer Manufacturers’ Association, an organization developed in 1997 that sets the standards for household, commercial, farm and consumer use of pressure washers. To qualify, the manufacturer must follow the rules of the Performance Verification Program, a program controlled by a third party that ensures the verification of maximum water flow and pressure. Does the hose have to be completely unwound to use? With some washers, you don’t get enough water pressure built up unless the hose is completely unwound and straight. With this GreenWorks, however, in many a user review it’s said that owners of the unit use it while the hose is mostly wound up if they don’t need the entire length to do the job, and it still works very well. This unit is very easy to store. However, like with anything that uses a water hose, you’ll want to disconnect and drain the hose prior to storing it. Since the handle collapses to about 18” in height for storage, it’s easy to slide it under a shelf or between cabinets in the garage. What does it clean best? What’s the best way to clean a deck using a pressure washer? There are many ways to do any job, so they say, but it’s a lot easier to learn from the mistakes of others than create your own trial and error. That said, here’s the best way we’ve found to pressure wash a deck. First, get anything off it that’s in the way – this means plants, toys, furniture and anything else you may have lying around that you could trip over or the hose could get tangled up in. Cover anything that shouldn’t get wet like outlets, light fixtures or plants you can’t move. Give it a good sweeping to get rid of obvious debris like leaves, twigs or other things that have blown onto it from your yard. Then, make sure you close any nearby doors or windows, or you’ll be spraying the interior of your house. After you’ve prepped the entire area, you’re ready to clean it up. Start by giving it a good rinse to get rid of any obvious dirt that didn’t get swept away. Then, use the soap nozzle to apply the detergent. Apply it from bottom to top, and make sure you get all the edges of the fences and railings. Take a scrub brush and go over any areas with tough grime. Don’t forget the corners and between the balusters of your railing. After all this, let the soap sit for a little bit, but make sure you don’t forget about it so it dries. After the suds are done, it’s time to rinse. It’s best to work along with the grain of the wood when doing your spray to get the soap off. Start at the top and work your way down to prevent streaks, and overlap your passes so you make sure you don’t miss any spots. Once it’s spotless, let the deck dry for at least 48 hours. After it’s dry, you can then apply a sealer or stain according to the manufacturer’s instructions. What’s the best way to clean my siding? • Make sure before you begin you water all the plants around the perimeter of your home. If they are well-watered, they’re less likely to soak up the soapy chemicals you’ll be using.• Check for any chips or cracks before you start and repair them if possible. Fix any siding that has come loose.• Make sure all your windows are closed and the exterior caulking is intact.• Try not to direct the spray between the vinyl slats to avoid it penetrating the insulation.• Keep the wand at a 45-degree angle. This lifts off dirt better than hitting it straight on.